SAC incorporates several ways to view and manipulate the consoles. Each of these can be arranged and stored in F-Key screen configurations for instant recall, or called up through menus or shortcuts. The F Mixer displays an overview to the console. At the top of the mixer, channel numbers are displayed for selecting channels for group action, and moving channels. Shortcut links to various portions of the channel strip are displayed next, which can be single clicked to bring that section into focus in the Z mixer if it is on screen, or double clicked to call up the E mixer with that section in focus. Directly below the shortcut links, the channel label is displayed. The channel label can be modified here with the shift-click action for an individual channel and the control-click action for multiple consecutive channels. Below the channel label, the solo and mute switches are displayed, followed by the fader and meter. The F mixer can be resized vertically and horizontally with the vertical minimum set at the size of the fader plus the mute and solo switches, and a one channel horizontal minimum. The maximums are limited only by screen size. Horizontal resizing occurs in increments of full channels only. Resizing can only occur when no channels are selected for modification. The F mixer is vertically scrollable by holding the right mouse button and moving the mouse, and horizontally by using the right and left arrow keys or the mouse wheel. 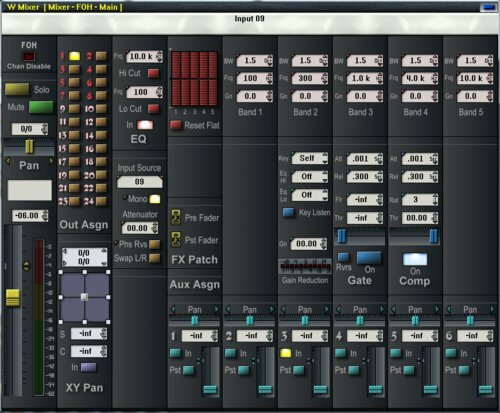 The F mixer is used most often for viewing and navigating the mix, and can be used for mixing, as all available controls are manipulable. It is often used in conjunction with another view for added control. The E and Z mixers are functionally similar, but serve different purposes. The Z mixer is permanently positioned on the screen, while the E mixer is called up for temporary usage. Both mixers display the entire channel strip in a vertical format, so all channel functions can be accessed from these mixers. The E and Z mixes are both scrollable by holding the right mouse button and moving the mouse, but only the Z mixer can be resized. Right-clicking on or clicking outside the E mixer will dismiss it from the screen. The Z mixer can be resized both vertically and horizontally, with the vertical minimum set at the height of the channel fader, and the horizontal minimum of one channel width. The maximums are limited only by screen size. Horizontal resizing occurs in increments of full channels only. Resizing can only occur when no channels are selected for modification. The E mixer is a pop-up mixer most often used for quick adjustments to parameters when the F mixer is on screen but the W or Z mixer is not. 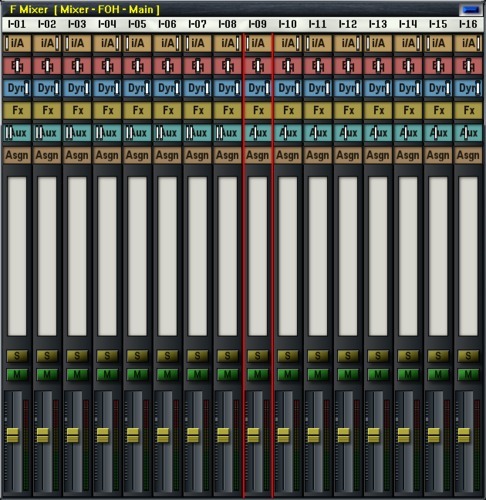 The Z mixer is useful for viewing any parameter on the mixer across multiple channels simultaneously, or for a small expanded view of the channel strip in combination with the F mixer. The E and Z mixers are vertically scrollable by holding the right mouse button and moving the mouse, and horizontally by using the right and left arrow keys or the mouse wheel. You can also jump vertically section by section using the page up/down keys, or by using the direct access shortcut keys. From top to bottom the shortcuts are: I=Input, E=EQ, D=Dynamics, X=FX Patches, A=Auxilliary Sends, O=Output Assignments, L=Channel Label, F=Fader. The W mixer displays the entire channel strip in a wide format that can fit on all but the smallest screens, so all channel functions can be viewed simultaneously. Only one channel at a time can be viewed on the W mixer. The W mixer can only be resized vertically. The vertical minimum is set at the size of the fader, primarily to aid in viewing on small resolution screens. The W mixer is vertically scrollable by holding the right mouse button and moving the mouse, and is technically not horizontally scrollable, as it displays only one channel and cannot be horizontally resized. However, the right and left arrow keys and the mouse wheel still allow movement between channels in the console. For additional detail about fx plugins patched on the selected hot channel, two list views are available to manage the Pre-fader and Post-fader fx patch points. There is also an FX Choices window that displays available plugins and operates in conjunction with the patch lists to add plugins. All three windows are independently sizable. The two patch lists have four buttons across the top of each. The buttons allow adding an instance of the current selected plugin from the FX Choices window, removing the selected item from the patch list, clearing the patched plugins, along with a shortcut to display the FX Choices window. Adding or removing plugins are only done with these buttons or channel memory actions. Holding [ctrl] and pressing the [up arrow] and [down arrow] keys will move a selected plugin within the patch lists. The FX Choices window allows creation of groups (short user-defined lists of plugins) These groups are retained independent of mix sessions or preferences. You can create and view only subsets of plugins as well as set any group as the default displayed group.